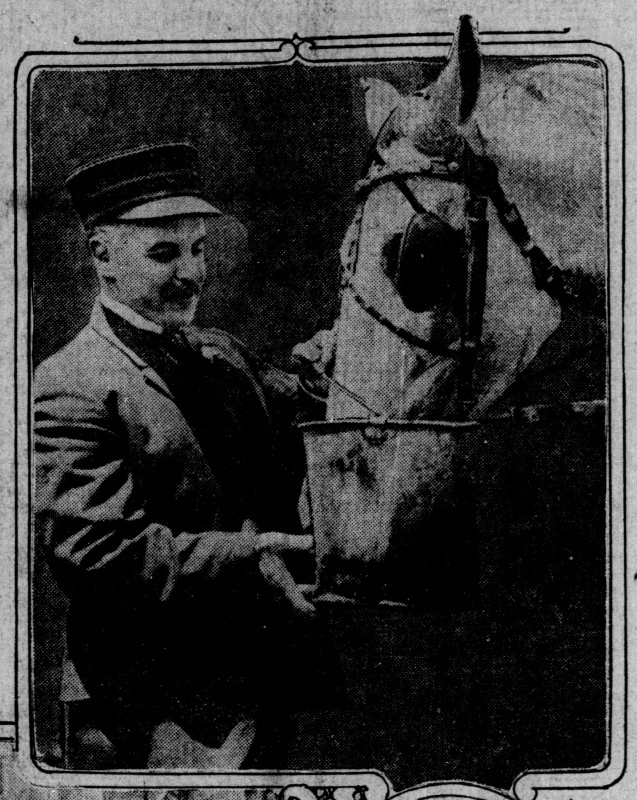 This article, from The San Francisco Call, Wednesday, 04-June-1913, tells the story of the last horse car to run in regular service in San Francisco. Sunny Jim Rolph, the colorful mayor of San Francisco, liked to operate transit vehicles on special occasions. The City Hall he stopped at was the temporary one on Market Street, now the Hotel Whitcomb. I think "L'Envoy of the Sutter Street Horsecar" is making fun of "L'envoi" by Robert W Service rather than "L'envoi" by Rudyard Kipling. Snapshots of the passing of the horsecar in San Francisco. Mayor James Rolph Jr., wearing a conductor's cap, watering the last old car horse in service; Car 45, the last of the Sutler street horsecars, rolling along Market street (center), and the mayor holding the reins over the animals hauling the ancient vehicle on its final trip. Snapshots of the passing of the horsecar in San Francisco. Mayor James Rolph Jr., wearing a conductor's cap, watering the last old car horse in service. Wearing a conductor's cap and a broad grin, Mayor Rolph drove the last of the horsecars up Market street and through the Mission yesterday, passing, below Sansome street, the first of the Sutter street cars en route to the ferry. A jubilant noon hour crowd cheered itself hoarse as the historic relic rumbled on its final Journey. Auto horns tooted, firebells clanged and shouts of "Good boy, Jim!" filled; the air. 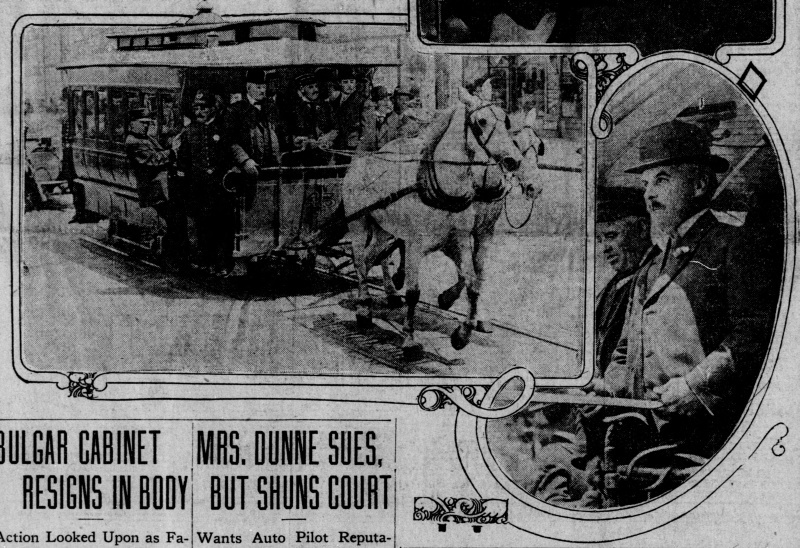 It was the funeral of the horsecar, but also the inauguration of through service to the ferry for the Sutter street line. One event caused as much joy as the other. About 150,000 persons, according to Supervisor Hayden, are served by the Sutter line and its Jackson, Clement and Cliff arteries. After years of waiting while the city and the United Railroads battled in the courts, they at last can travel to and from the ferries without the delay and inconvenience of transferring at Market street or riding on the creeping horse cars. At the same time the Geary street municipal railway began enjoyment of transfer privileges with the Flllmore and Divisadero street lines, swelling the receipts of the city road and affording increased accommodations to patrons of the line. Promptly at noon Mayor Rolph boarded the last horsecar, No. 45, at the ferry. He had promised the night before, when the supervisors voted to allow the Sutter street cars to run to the water front, that he would drive the last horsecar from the streets of the city. Patrick Calhoun, president of the United Railorads; Thornwell Mullally, his assistant, and other officials of the company climbed aboard with members of the board of supervisors and other city officials. Mayor Rolph was crowded to the front platform as the signal was given for the start. "Drop the reins of office and take up the reins of the last horsecar," shouted Supervisor Hilmer. "All aboard for the last trip! All aboard!" A spanking team of white horses, one bearing the appropriate name of Jim and the other George, gave the mayor all he could handle from the start. He had no opportunity to lift his hat to the shouting throng at the loop. "We're off!" yelled the mayor. "Farewell to the horsecars." Up Market street the car proceeded like a Roman chariot bearing home a conquering hero. "Talk about your old time races," cried Thornwell Mullally gleefully. "Delightful. A great day," echoed President Calhoun. "Anybody on the roof?" queried the mayor anxiously, with the perspiration streaming down his face. "No, but you're liable to lose your hat if you look up," said some one. "Wear my cap," volunteered J. H. Lee, the veteran driver, who acted as auxiliary manager of the brake. Rolph exchanged headgear and became, under the cap and gold braid, a regulation "front end" railway man. Newspaper photographers and moving picture operators sped along the line in autos recording the history making event. "This is a real live team," panted the mayor as they approached the Sutter street intersection. At this moment the first Sutter street car to run through to the ferry swung into Market street. Shouts of congratulation were exchanged between the laughing passengers of the modern electric tram and those on the obsolete horse drawn affair. The meeting of the two cars, one on its way to the scrap heap and the other to a long hoped for goal, was an incident of deep significance. "Here she comes, the first Sutter car. Hooray!" exclaimed Rolph. "Looks good to me," agreed Mullally. "Long may she run." "Our sentiments too," chorused the supervisors. Patrick Calhoun smiled apprecialively. Enthusiasm was intense among the thousands who formed a living hedge on either side of the tracks. A cordon of mounted police made way for the mayor's white horses. An officer clung to the front step to repulse boarders. At the gore of Kearny, Third, and Market streets bedlam broke loose. "Good boy, Jim. Hold 'em tight. Don't drop the reins. Goodby to the horsecars." and similar cries mingled with horns, bells, whistles and other demonstrations of joy. Women, who suffered most from the inconvenience of changing cars and keeping their balance on the swaying carryalls, added happy smiles and waving handkerchiefs to the gayety of the occasion. The spirit that moved the crowd to throw away new summer hats and dance on neighbors' toes reached the horses that Rolph was holding in check. They shied at the wreck of the old Geary turntable. For a moment a serious accident was feared. Plunging forward, the animals found the lead weight of the car on the up grade too great, and swerved sharply to the left. One animal apparently sat down on the front dash. The other, headed or Lotta's fountain. The crowd scattered. Rolph clung to the reins, supported by Mullally on one side and Driver Lee on the ether. Out of a confusing tangle of traces and hoofs Rolph managed to extricate the excited team. Policemen ran to their heads. Persons at a safe distance shouted advice and made remarks, complimentary and otherwise, concerning the mayor's horsemanship Rolph smiled through it all, but his face was wet. "You can't blame those horses." he laughed. "They wanted to switch off along our new Geary street line." Without further delay the novel journey continued up Market. It was suggested that other officials should have a hand in driving the horse car off the street. Mullally took the reins and proved that he could run a single car as well as the entire United Railroads. James Rolph Sr . father of the mayor, also took a turn at driving. Then President Calhoun stepped to the platform and gathered up the lines and whip, driving for several blocks. Rolph held the "ribbons" when a stop was made at the city hall, where city employes shouted congratulations from the windows. "On to the Mission," said Rolph. "Get up there, Jim and George." Out along Valencia street "Mission Jim" and the strange cavalcade received a welcome typical of the district. Automobiles and other vehicles fell into line, and the triumphal horsecar trip became an impromptu parade. Edward Rainey and Sylvester McAtee, secretaries to the mayor, decided that it was time for the horses to rest and partake of refreshments. Rainey secured a bunch of hay and McAtee two buckets of water. Rolph treated each animal to a copious drink. At the carbarn at Twenty-eighth and Valencia streets the eventful Journey came to an end. What will become of the horsecar?" asked Rolph as they deserted the relic of primitive transportation. "Oh, we wiil take care of it," laughed Mullally. "It ought to be placed on exhibition in the Transportation building of the exposition," suggested Supervisor Hayden. "At any rate, this is its last trip," replied Mullally. President Calhoun, Rolph and Mullally shook hands with the regular driver of the car, J. H. Lee, a survivor of many voyages on the weather beaten vehicle. Lee's eyes were moist as he left his old command. For 32 years he has seen continual service with the company, most of the time on horse cars. 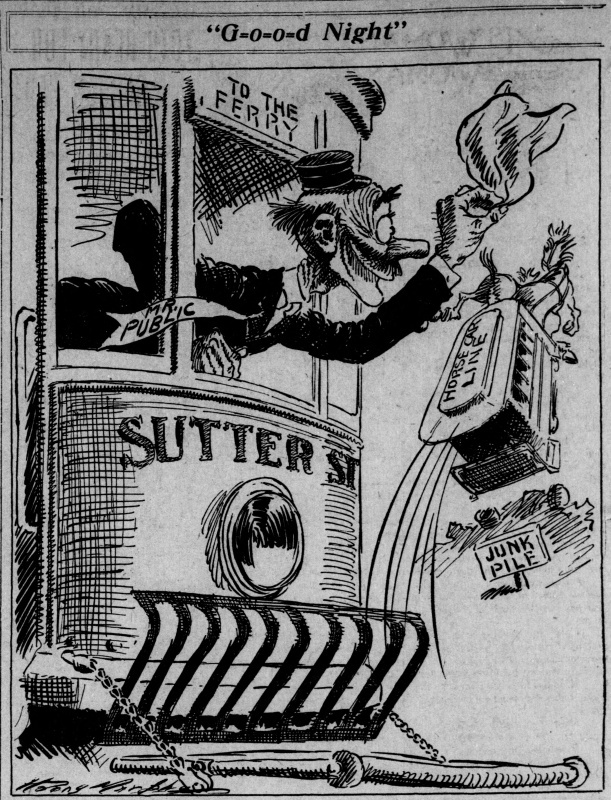 He first drove on the Howard street horse line, and except for the brief period of electric service after the fire lias been, driving the Sutter horsecar since. A vacation has been granted him, affording him an, opportunity to take a long wished for trip to Panama to see the canal. On his return he will take a position as motorman for the company. George B. Willcutt, secretary controller of the United Railroads, was one of the happiest passengers aboard. He rode on the first car operated on Market street early in the 60's, when horses surplanted the original steam road. "And now I am riding on the last horsecar," he said. Others who made the trip were Superintendent Thomas A. Cashin of the municipal railway. Superintendent H. T. Jones of the Turk and Fillmore street lines: W. T. Wright, chief inspector of the United Railroads; F. C. Boeckmann of the same company; C. H. Bennett, the conductor; G. T Neece, Superintendent of Public Buildings; T. A. Reardon, Sergeant Thomas Walsh, detailed at the Mayor's office: Paul Foster, Supervisors Hilmer, Hayden, Mausy and Vogelsang. As the last horsecar passed the first trolley car of the Sutter street line Rolph and Mullally were saluted by a delegation of the Portala Festival committee and the Down Town association, passengers on the trolley car. This delegation was headed by Andrew G. McCarthy, a member of both organizations, and Otto K. Schiller, their engineer. And that has ever been my little game. I was a very, busy little road. Till the flowing waters busted up my game. They seeded there the great sequoia trees. And heap on me tremendous obloquy. Invented cars that go without a horse. Has kept this city looking like a cave, man! -- A. L. P.